Upon walking into the small space that houses Daniel Hutchinson’s quietly dramatic exhibition Paintings for Electric Light, I took a moment to orient myself to the darkened room punctured by subtle glows; an electric light radiated in a palette that was seductive, trendy, and strangely nostalgic. On the gallery walls, a group of canvases and panels, in thick black oil paint, partially illuminated with coloured fluorescent light, drew me in for closer inspection, immediately playing with my perception of space and surface. The potential of light as medium instinctively conjures up superficial parallels with Dan Flavin’s celebrated fluorescent tube installations. However, it is his earlier series Icons (1961-1964), monochromatic objects paired with light sources, that perhaps more fittingly serves as a comparison. 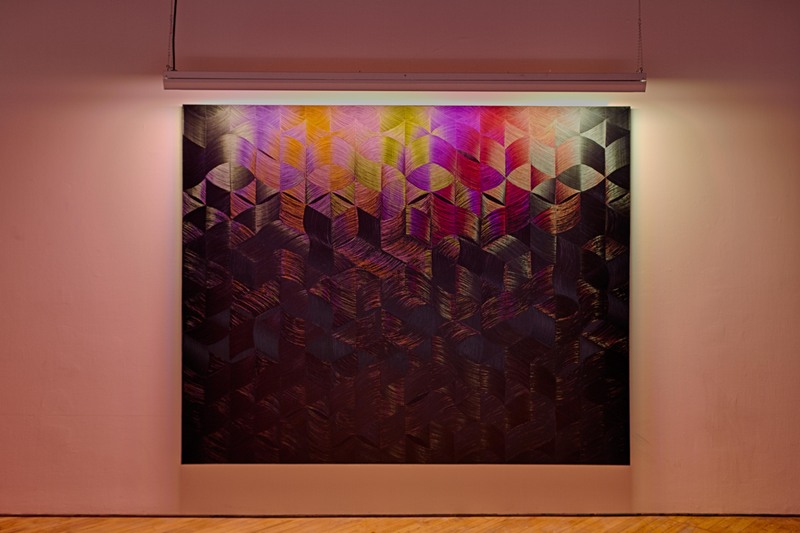 In merging between painting and installation, it is the symbiotic relationship between light and paint that calls attention to the elements of display and the materiality of painting. In Hutchinson’s new series, the light literally illuminates the non-objective nature of the works, calling attention to the surface of the painting: to the thickness and depth of the paint, and the brushwork. The series reveals an exploration of line, pattern and form. This physicality contrasts with the vibrant ephemeral nature of the coloured light, as it is reflected on the painting’s textured surface. Thus, movement, as well as the spectator’s relation to the works, becomes as significant as the medium and the apparatus of the light source. PATRICIA RITACCA is a graduate of the University of Toronto’ MA in Art History, Contemporary program. Her curatorial projects include Nature in the Garage, liveARTs/City of Toronto, and Dionne Simpson: 4′ x 4′, Art Interiors. Ritacca is based in Toronto.